Big-Box Swindle named a Booksense Pick for November 2006 and 2006 Book Sense Pick Highlight! Large retail chains have become the most powerful corporations in America and are rapidly transforming our economy, communities, and landscape. In this deft and revealing book, Stacy Mitchell illustrates how mega-retailers are fueling many of our most pressing problems, from the shrinking middle class to rising water pollution and diminished civic engagement. Mitchell’s investigation takes us from the suburbs of Cleveland to a fruit farm in California, the stockroom of an Oregon Wal-Mart, and a Pennsylvania town’s Main Street. She uncovers the shocking role government policy has played in the expansion of mega-retailers and builds a compelling case that communities composed of many small businesses are healthier and more prosperous than those dominated by large chains. More than a critique, Big-Box Swindle draws on real life to show how some communities are successfully countering the spread of mega-retailers and rebuilding their local economies. Mitchell describes innovative approaches-from cutting-edge land-use policies to small-business initiatives-that together provide a detailed road map to a more prosperous and sustainable future. "This is the ultimate account of the single most important economic trend in our country-the replacement of local businesses, and all they represent, with the big boxes. What Nickel and Dimed did for the Wal-Mart worker, Stacy Mitchell does for the community threatened by mega-retailers." "	"A great read! The big-box shadow looms over us mightily, but, as Stacy Mitchell documents, hundreds of communities have already saved themselves. She tells us how they did it and firmly invites us to step forward into the light. Change-a-lujah!" "Big-Box Swindle is a well-researched and frightening book about an economic pandemic engulfing the United States…The big boxes are draining cities and towns of money and bankrupting neighborhood businesses that have long been the backbone of American communities. 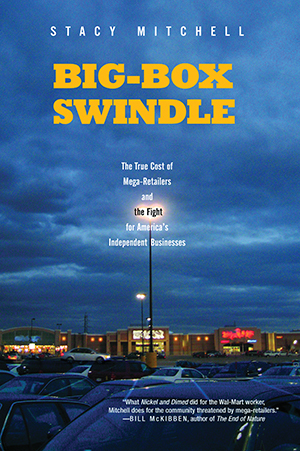 Big-Box Swindle is a book every citizen needs to read." "Stacy Mitchell provides an astonishing exposé of the broad-reaching implications of our shopping habits. Big Box Swindle should be required reading for everyone who cares about America's main streets, as well as a call to arms to small businesses everywhere to organize and take action." "Through rich, real-life stories, Stacy Mitchell reveals that those 'low prices' so proudly promoted by big-box behemoths come at an intolerably high cost to our communities and culture. Can we beat the behemoths? Yes! And Mitchell shows us the way. Read on, take heart, and take action!" Visit the website for Big-Box Swindle.